The year is 1999. Television is cashing in on the blood lust of its viewers. Violence dominates the screen. Topping the ratings are the TV game shows that offer the ultimate in prizes: your life! Winning and losing has become "destroyed or be destroyed." 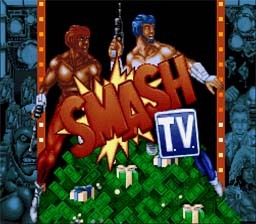 One show stands as the toughest, most spectacular, most dangerous, and most rewarding contest of all: SMASH TV. Alone, or in a pair, powerfully armed contestants are sent into a closed arena. There, before a live studio audience and devoted TV viewers from around the globe, they battle opponents - human, humanoid, and inhuman - and search out the cash and prizes that will make them SMASH TV Grand Champions. Ready for prime time? --From the SNES Super Smash TV instruction manual. Play Super Smash TV Now!